Rotadairon offers Soil Renovators for the perfect seed bed in one pass. With reverse rotation blades, screening rods, grader blade and packer roller they are able to perform several functions at once. With several sized machines capable of working depths from 5″ to over 12″, the Soil Renovators provide a firm, level and clean finish to the seed bed. 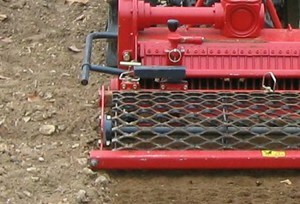 The screening rods are the secret that allows the machine to sort and bury material. These rods bury about 30 tons of stoners per hour making them ideal for seed bed preparation. –1958– DAIRON establishments are created by Mr Dairon in France. It’s main purpose back then was to build farm machinery for harvesting. –1960 to 1971– Production expanded to include a new range of rotary hoes, which were the first machines to bear the name RotaDairon. RotaDairon USA is STEC Equipment. STEC Equipment is a North American Distributor. STEC Equipment is Located in ANDERSON SC.